Chain Link fences are affordable, durable, transparent and have a quick installation time, this makes it one of our most popular fences. 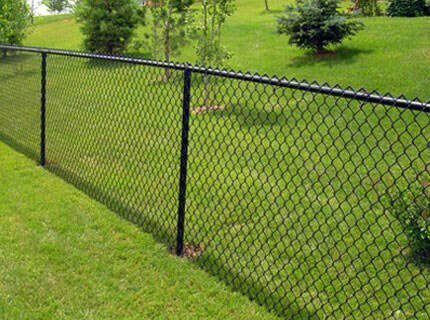 A chain link fence is the best option for you if you are looking for a very durable fence at a low price. The transparency that a chain link offers makes it popular for containing pets and keeping kids secure while also being able to see them. Chain links are our most affordable alternative to a cedar or iron fence. Are you looking for a galvanized or color coated chain link fence in Weatherford? Heres some thing to consider. 1. Our galvanized chain link fences are extremely durable, strong and weather resistant. You won't have to worry about the lasting power of your fence, even with the changing weather. 2. Our color coated fences come in green or black vinyl, this coating gives the fence an extra layer to protect the steel from inclement weather. It will also give it a great look for your outdoor features. The is no ongoing maintenance on your new chain link fence, once we install in correctly in Weatherford. You'll be able to enjoy your new nice looking fence for years to come. This way you can put time enjoying the outdoors with you family. Our experienced staff will be able to help you choose the right gauges or thickness of the metal for your chain link fence. Our staff will be able to assist you in the decision making process to meet your fencing needs. Fill out the free instant quote from to get started on your new chain link fence. call us today at 817-382-4614.